previous article Who are the German soldiers? In the end, what differences? Most of the Germans occupying Belgium will stay there for several years. They will live alongside the Belgians every day, and gradually get to know them. But what do they think of them? What do they see in the civilians whom they meet every morning? Do they make distinctions, or are they simple a "vanquished people" for them? What will they say about the Belgians once back with their families? In the German texts, even though they are asked to regularly report on the attitude of the population, the officers only make rare references, once or twice per year in the best cases. The perception of the local population in the minds of the occupation forces is tied to the location where the latter are stationed. While general reflections on the Belgian people can be largely deduced by German behaviour, the reports focus on the local population that is directly in contact with the troops. It is necessary to situate the various texts within their context, as inhabitants of the countryside do not have the same concerns as citydwellers, nor as the people living along the Dutch border, who are living under very strict control in order to prevent smuggling. In Aubel, for example, the Germans discover a rich and bountiful territory. They describe the villages, where everything is focused on animal breeding, right down to the layout of the houses. The Germans prove to be quite severe, with this region's inhabitants being described as unwilling to make an effort, and looking after their animals poorly, which are in bad condition. They would even apparently have been quite happy to steal from one another upon the arrival of the German troops. A story is told to anyone willing to listen, about Belgians who had fled to the Netherlands during the invasion and who, upon returning home, filed a complaint with the Germans against a family of Jews in Battice, that apparently visited all of the empty houses in advance of the occupation troops, before taking refuge in the Netherlands. They are also described as a very pious people, easily manipulated by their priests, notably about the idea that Germany violated Belgium's sovereignty in August 1914. Even the slightest defeat of the Germans, real or not, is directly reflected in the behaviour of the population, though the inhabitants display great calm and a peaceful attitude relative to the occupation troops. "To the Commander of the battalion at the Aubel gendarmerie" "Colonel, I respectfully take this opportunity to inform you that, in Aubel, there is currently a band of fraudsters who, thanks to their familiarity, can successfully get young men across the border while providing them with all means needed in order to be able to get across; They have also taken a large number of letters from Holland to Belgium, and from Belgium to Holland. The men smuggle flour, and take advantage of this to get the young men across, who pay them very well; I can't tell you exactly how many letters they have brought across from Holland these days, as well as a number of photographs of Belgian volunteers sent via Holland. I learned about this affair because of a dispute between them, and I take great pleasure in informing you that these people are Magers Lambert, Magers Nicolas, Drouven Paul, Pesser Jean, and Nélissen Mathieu who make up this band of fraudsters; Sincerely, -signature illegible-". This letter, in which the orthographical errors have deliberately been included (in the French text), is followed by a translation in German along with notes on the addresses of the people who have been reported. "The civilian population is taken to a safe place"
The first is certain of the final victory of the Entente. They don't let themselves be convinced by the news of German military victories, they don't believe in the truthfulness of German newspapers, daily reports or Belgian newspapers subject to German censorship. This group draws strength from the Russian offensive and considers the naval battle (the battle of Jutland) to have been an English victory. This unshakable group also generally includes the priests, who are working along the lines set out by their ecclesiastical leader, Mercier. The second group is, unlike the third group, still interested in the war and, unlike the first group, it considers the news in the newspapers to be proven facts. Any defeats of the Entente chip away at their morale, while victories drive their hopes. They view the Russian offensive optimistically, they acknowledge the English defeat in the naval battle, but this doesn't call into question the English superiority in naval terms. The third population group is no longer interested in the war at all, primarily because of their economic weakness. Their only hope is peace, as quickly as possible. They have a lot of hope, for the moment. The English no longer really seem to be their friends, they have more confidence in the French. They talk very little about the Russian offensive." If we take the example of Liège as a big city, the situation is somewhat different. As the population is much larger, the reactions are much more visible / obvious. Each time there's news of a French or English attack, the population is filled with hope and comes out into the streets. During one of these events, an officer writes: "In Belgium, the population of Liège is known for getting quickly carried away by rumours of this type, and is capable of believing exactly the opposite the very next day". The other ripples noted by the occupation troops are seen in February 1916, during the complete interruption of mail traffic with the Netherlands, or in the summer months, when spirits are higher and the Germans notice that the people adopt a much less friendly attitude. The biggest problems that the occupation forces have to manage appear in the summer of 1916, and persist until the end of the war. They must deal with the "coal workers from Seraing and Ans, amongst others", unemployed since 1914, who gather in order to demonstrate against farmers and food retailers, who are accused of deliberately inflating prices. At the end of June, a crowd throws the products of two retailers into the Meuse, since they consider them to be too expensive. In July, other goods are thrown into the river at the time of the La Batte market. That same month, groups of young adolescents from Ougrée and Seraing are apprehended in the act of prowling around Boncelles and Plainevaux with the intention of "holding passersby and workers for ransom". To avoid such phenomena, German infantrymen will have to disperse the crowds and the governor has to issue an order with a reminder that threatening retailers and destroying their production constitutes theft or destruction as part of a gang. 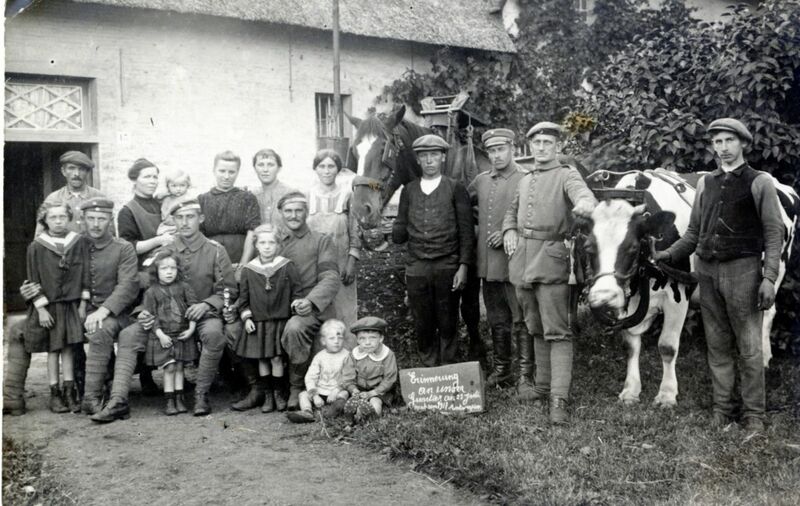 For their part, noticing that the harvests are not bad at the end of the war, the Germans blame producers rather than food retailers for the excessively high prices. In this last regard, a common interest arises between the occupation troops and the impoverished population. Also suffering from exorbitant prices, an officer admits that the patrols on duty in the valleys of the Ourthe and Amblève, charged with controlling poor people who have travelled more than 80 km through Luxembourg Province in order to get potatoes, often close their eyes to this trafficking and let them go by. Most smugglers in these regions consist of families looking to subsist by their own means, who are only carrying a few potatoes and some butter. Despite this common interest, there is never a feeling of friendship between the Belgians and the occupation troops. The Germans make a distinction between the various social classes of the population. According to the latter, "the poorest people will carry out the orders of the German authorities without particular resistance, as they seem to have great confidence in the organisation. Also, without the pressure from the Belgian government and the influence of the higher literate class, the ignorance of the order of things at the end of the war as much as the fear of even greater impoverishment is keeping the population under control. However, the Germans then have to deal with the more comfortable class: "Nevertheless, a friendly attitude towards the Germans should also not be expected. This comes from the fact that the measures taken by the German administration in Belgium can be detrimental to Belgian interests. We are coming up against the influence of the upper class that is in favour of passive resistance by the population. This translates into the removal of barbed wire, the refuge given to the unemployed who should be going to work in Germany, and the non-reconstruction of homes destroyed, that serve as proof of German atrocities". In 1918, the behaviour of the Belgians has not changed: while apparently accommodating and even sympathetic, for the vast part, they remain strongly opposed to the presence of the Germans. "They strive to avoid anything that could be seen as deutschfreundlich (friendly to the Germans) and avoid all contact except as absolutely required. They will never support the administration nor the occupation army, in particular in the event of decisions that aggravate the already heavily damaged economic situation (sic). This can be seen in the many complaints about the fines handed out by the general government, that are considered to be unfair ". During the last two years of the war, the Belgians, "despite the Russian defeat and the intensification of the submarine war", still firmly believe in final victory, notably after America's entry into the war. Germany's repeated desire to sign a peace treaty appears to be an admission of weakness. Nevertheless, the desire for peace is very strong amongst the population, primarily because of a lack of food. "No one doubts the restoration of Belgium once the conflict comes to an end". In July 1918, though the population remains under pressure, the atmosphere is full of hope since everyone can feel the approaching end of the war. The Belgians place increasing hopes in American aid. 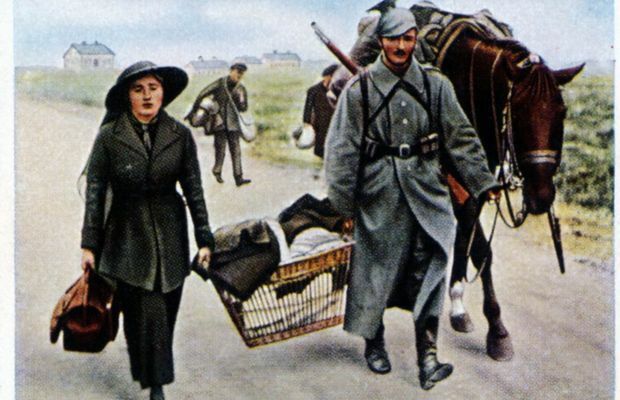 While the Belgians remain civilians having to be controlled and directed throughout the war, the Germans are more shaded in the reports that they send to their hierarchy. One can almost perceive a certain respect for the population's courage and unfailing faith in the ultimate victory. Certain officers will attempt to remain as neutral as possible with regard to the Belgians, describing them very objectively. Others even go so far as to explain their understanding of the hostile reactions to the measures that they are obliged to take, even sometimes almost admitting that they might be unfair. 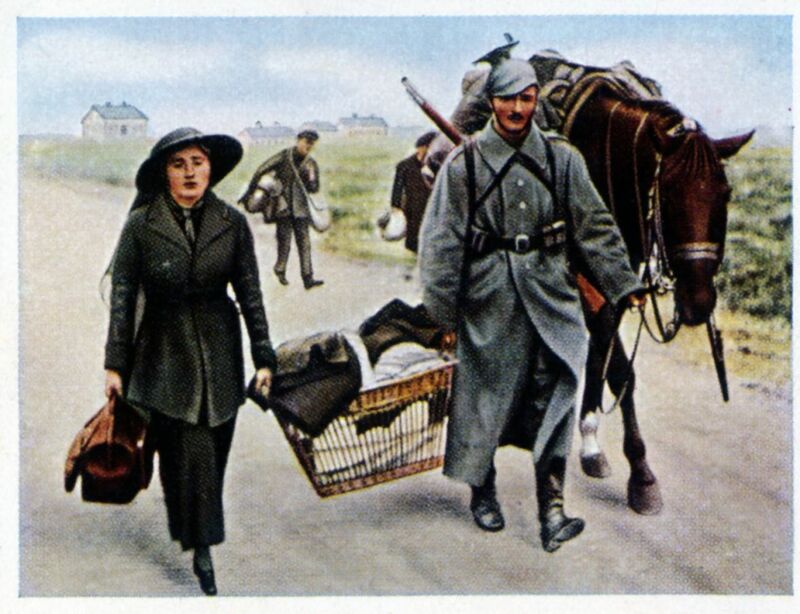 While there is no suggestion of any fraternization as in the trenches, it can be noted that after more than 4 years of "common life", the military discipline of the soldiers sometimes gives way to empathy relative to the needy civilians This softening of attitudes was undoubtedly helped by the vision of the growing destitution of their families still in Germany. RENCY G., La Belgique et la guerre, Tome 1. La vie matérielle de la Belgique durant la guerre mondiale, Brussels, Henri Bertels, 1920. DE THIER J. & GILBART O., Liège pendant la Grande Guerre, 4 volumes Liège, Bénard, 1919.